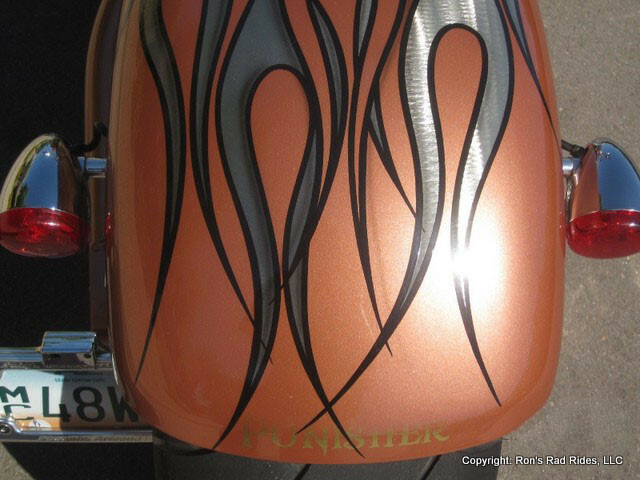 Pro Street - all Street Legal Items - Unique Flames..!! 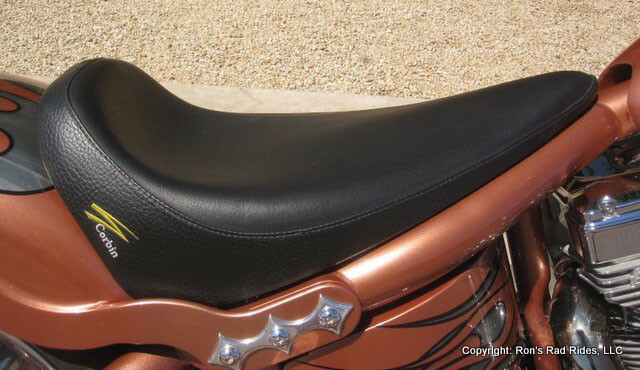 The Frame features great geometry and perfect rake/trail making it very friendly to ride. 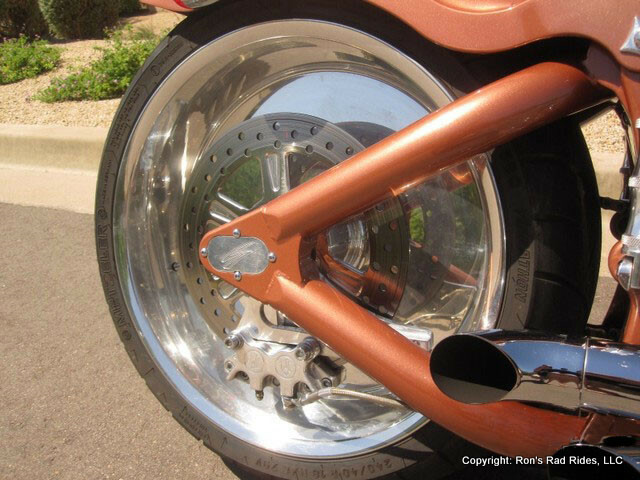 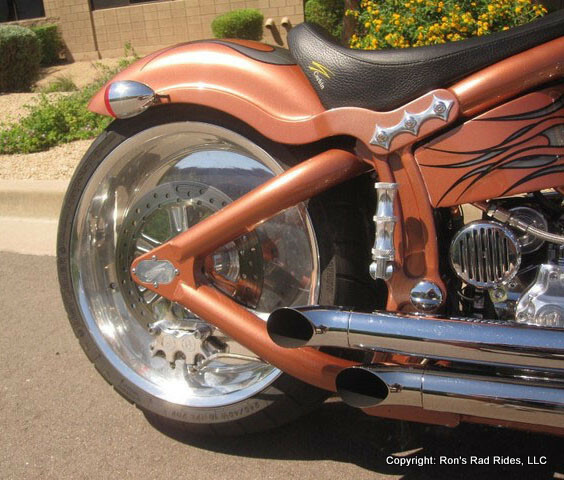 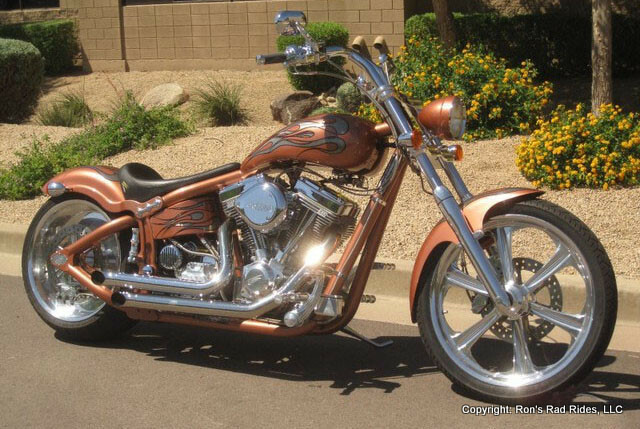 This bike features a Softail Frame with a floating rear Swingarm. 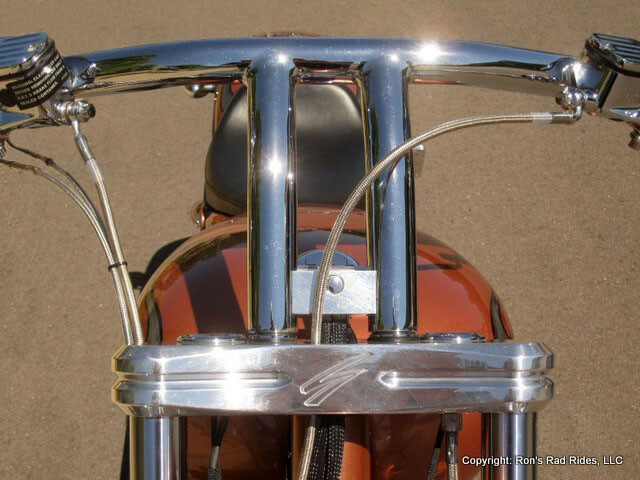 The Frame has a 4" Backbone stretch, the Neck has a perfect rake of 40 Degrees and the Triple Trees add another 3 Degrees of Rake to finish off the Pro Street Look. 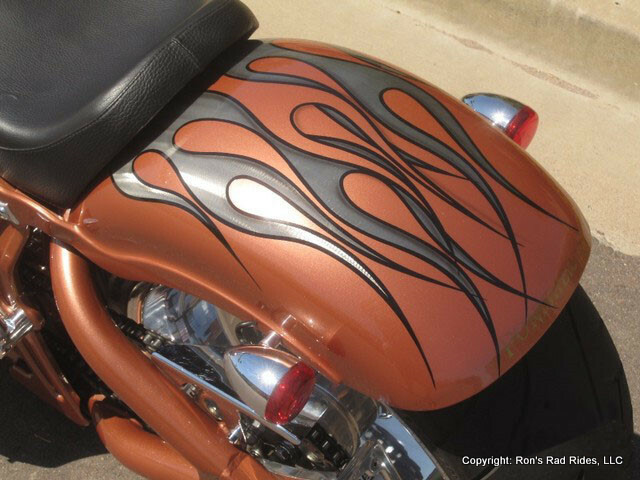 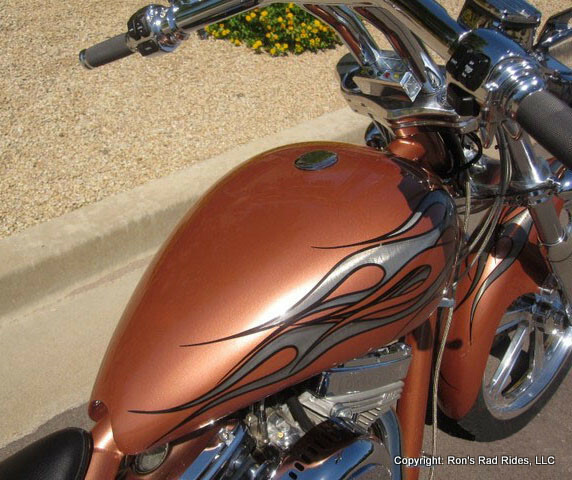 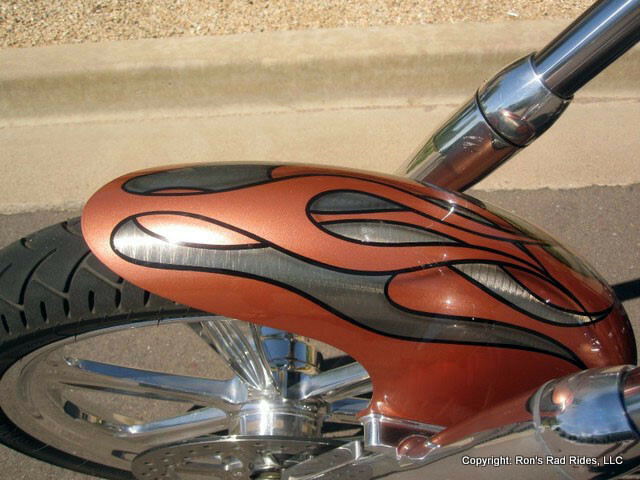 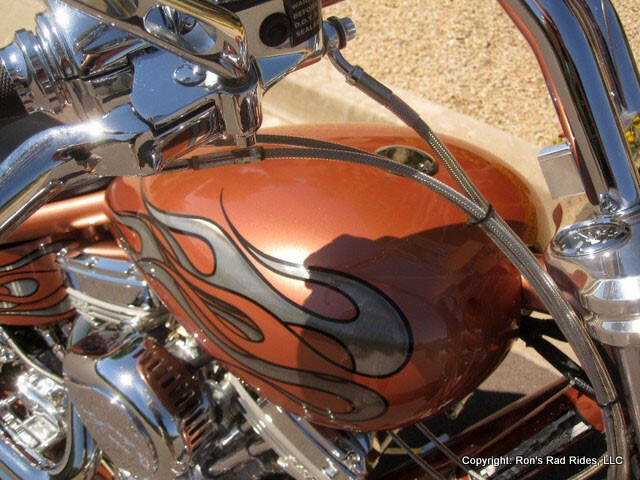 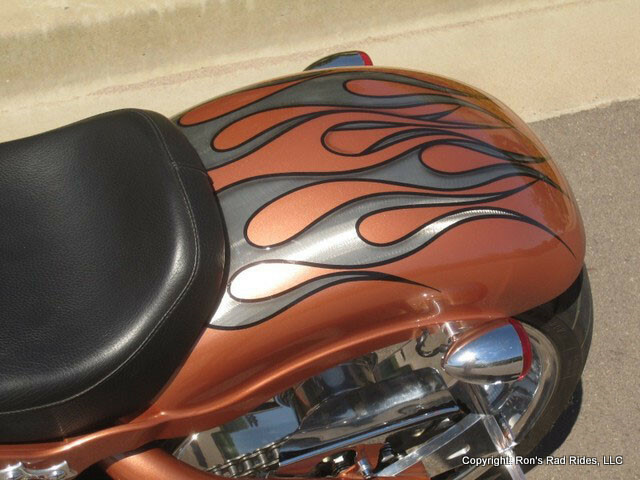 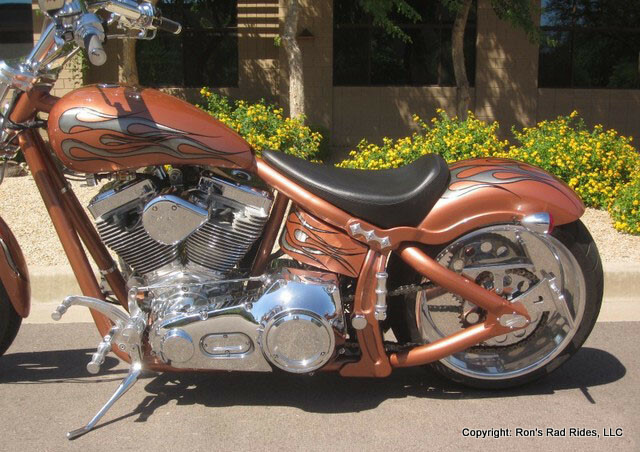 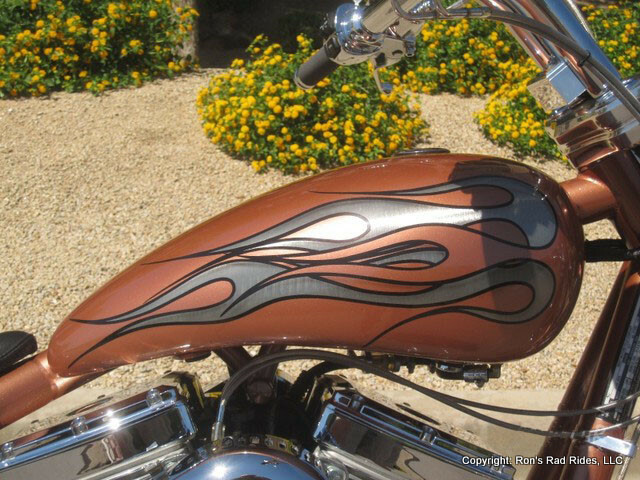 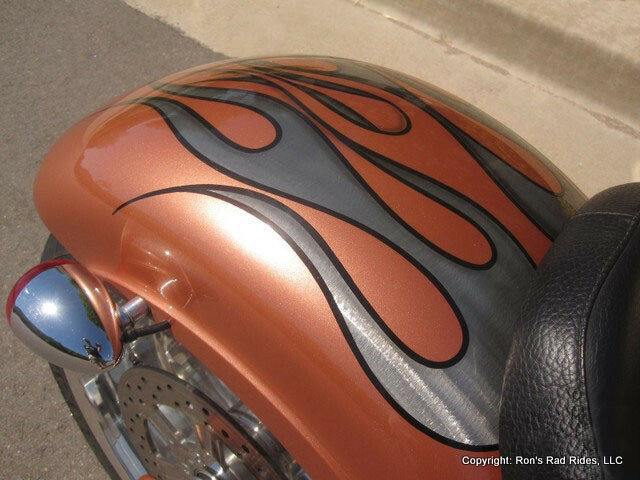 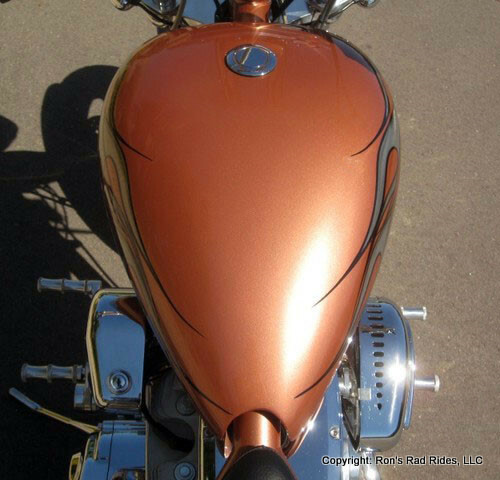 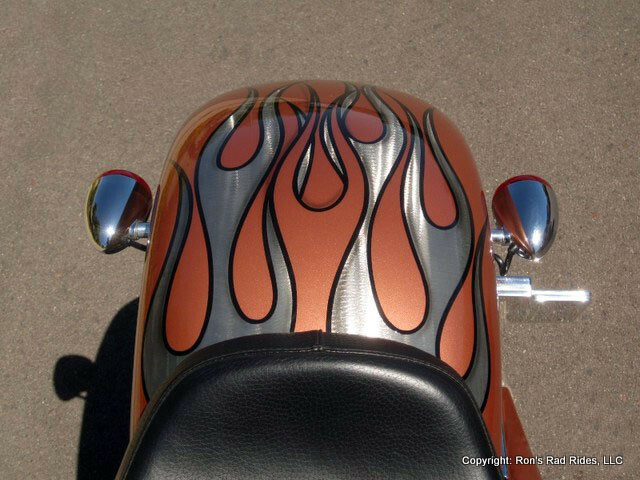 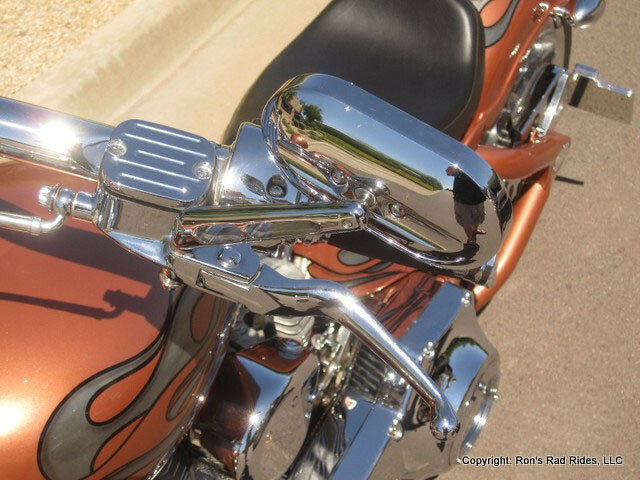 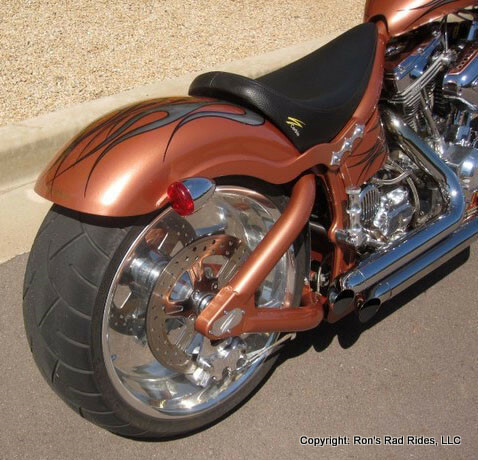 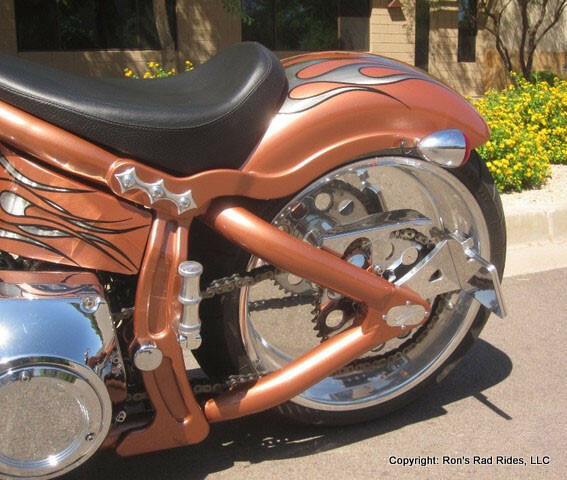 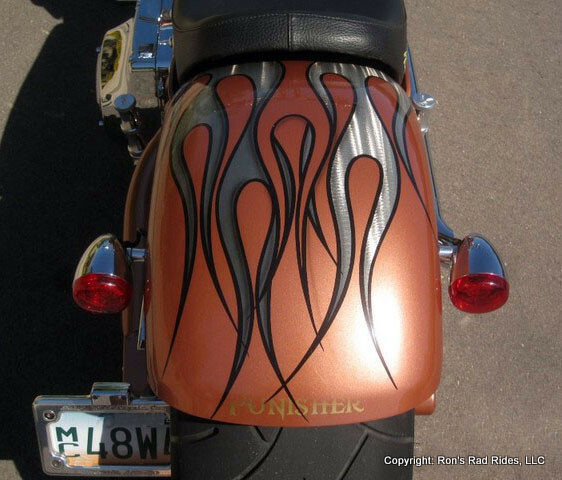 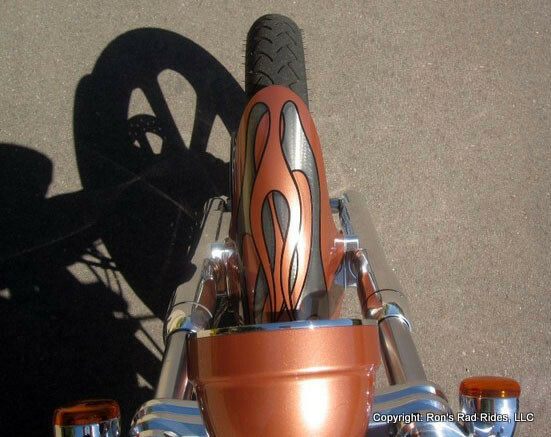 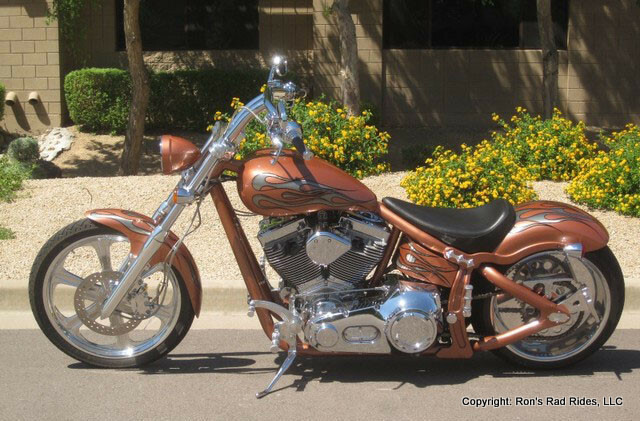 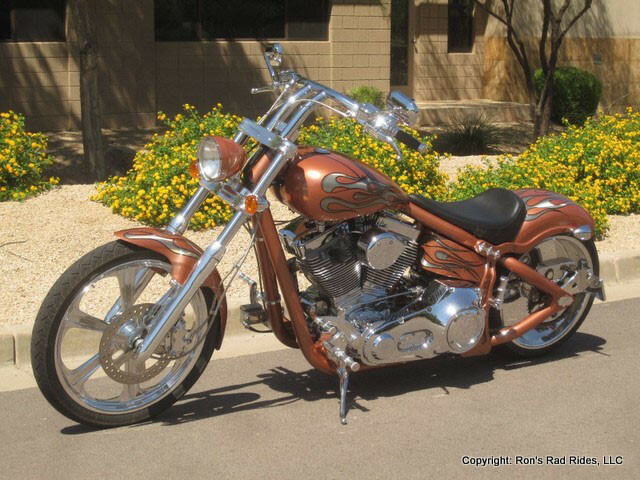 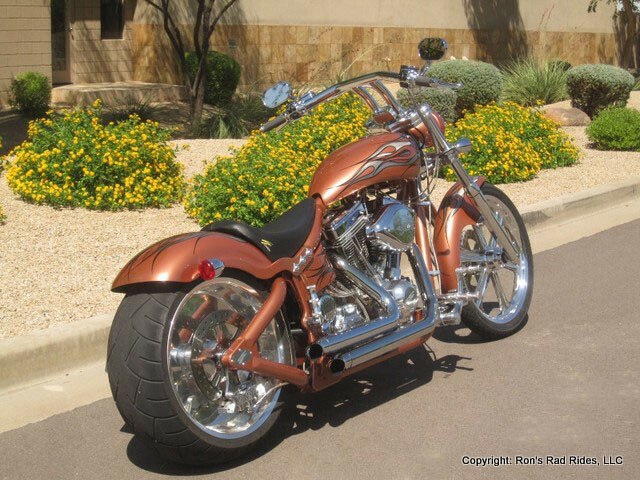 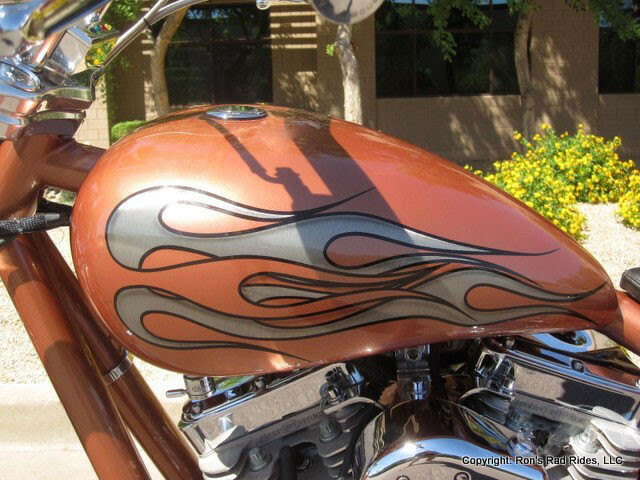 The very unique Paint scheme on this bike features a brilliant Indian Copper Metallic base coat with "Metal Grind" Flames and Black Pinstriping. 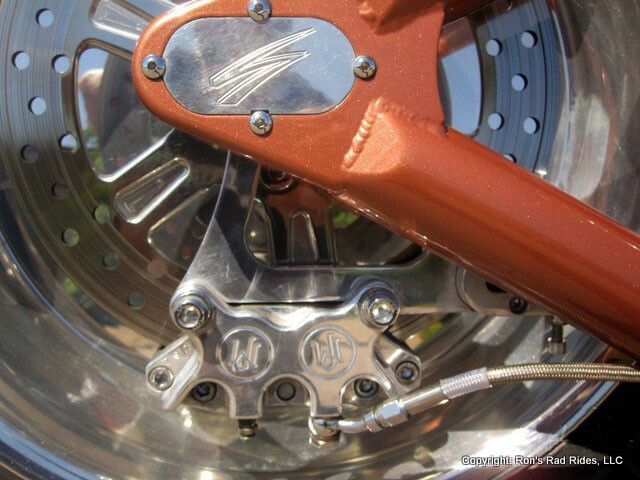 There are multiple clear coats added to protect the unique "Metal Grind" design. 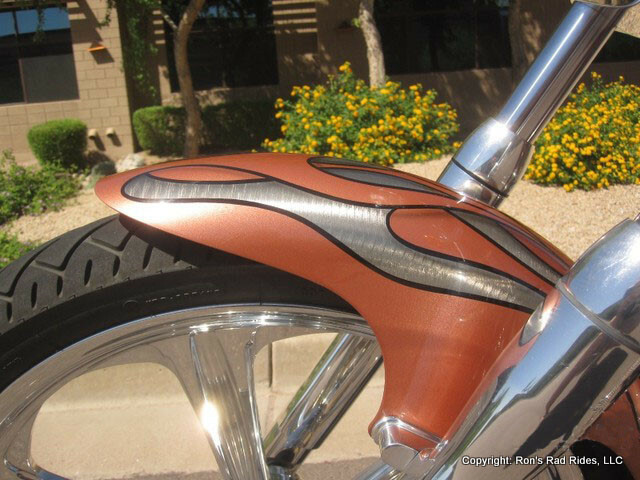 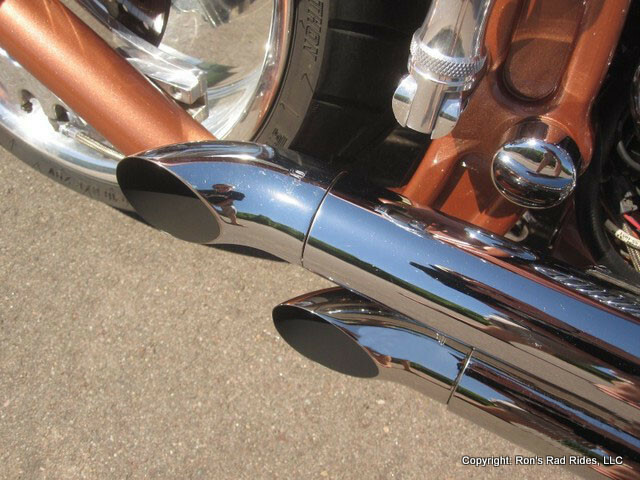 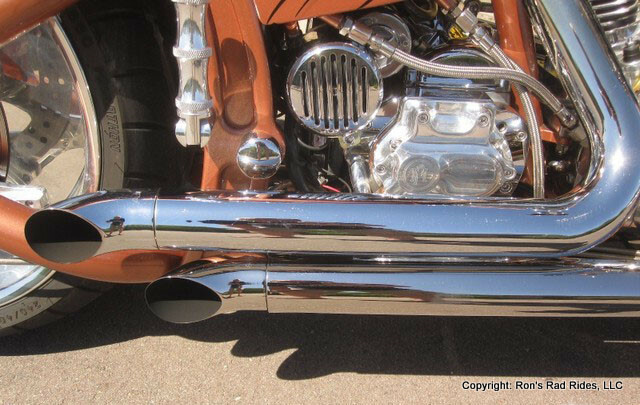 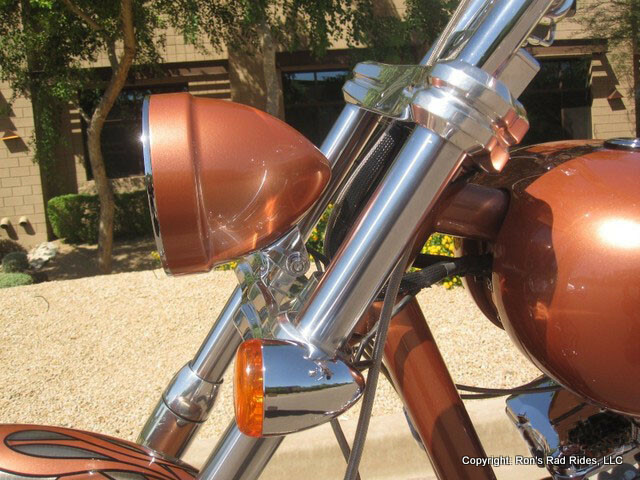 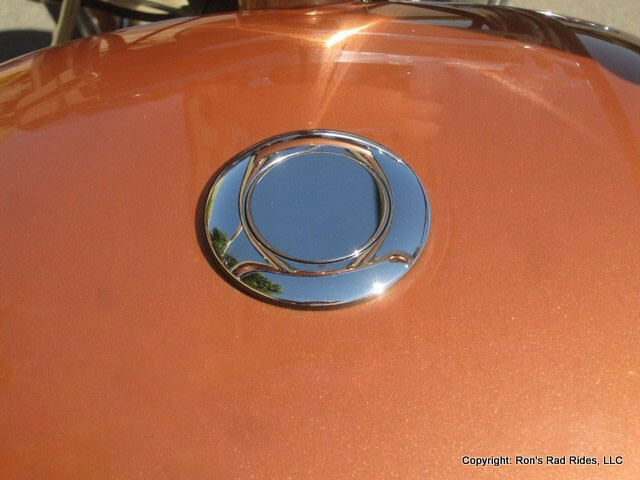 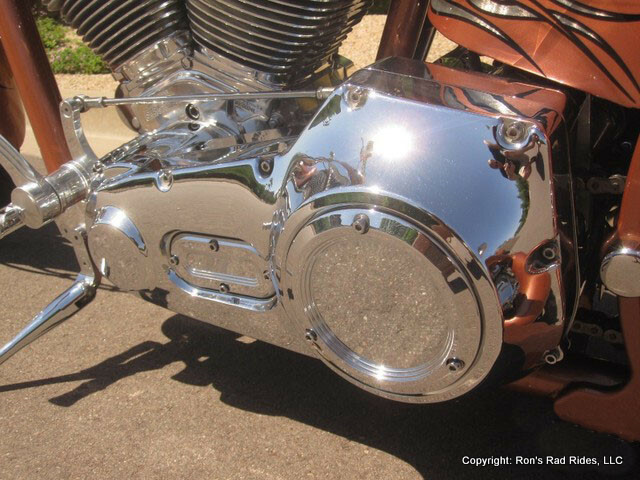 The Gas Tank is stretched with a Chrome Pop-Up Style Fuel Filler, and the Rear Fender features a Swing Arm mount for a floating Fender look. 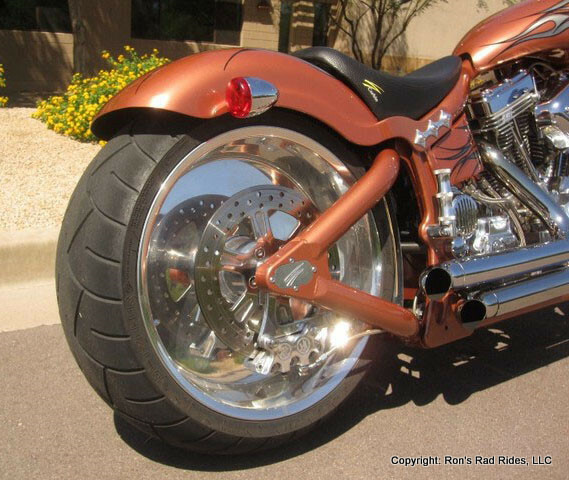 The trademark Swift "Fat Frame" and Swingarm are color matched to the rest of the bike color. 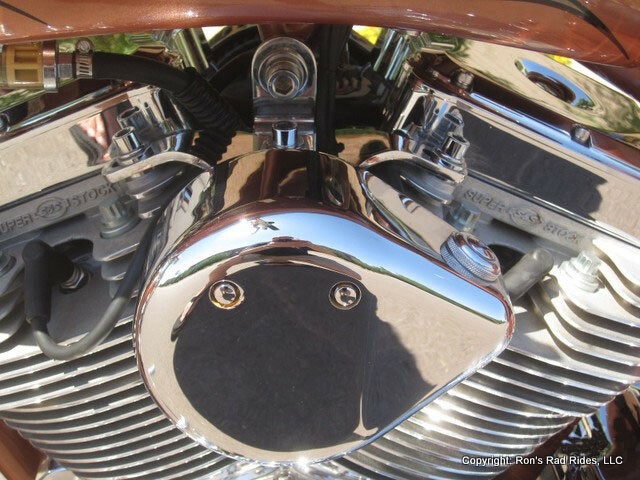 The Paint is in superb condition, and has no signs of damage. 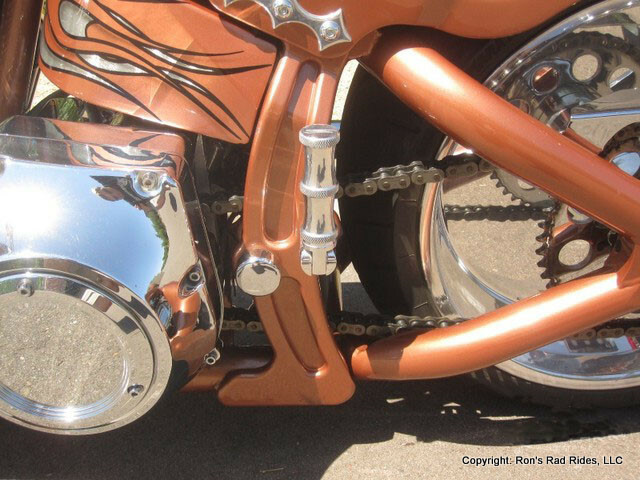 Essentially, this bike looks like brand new yet! 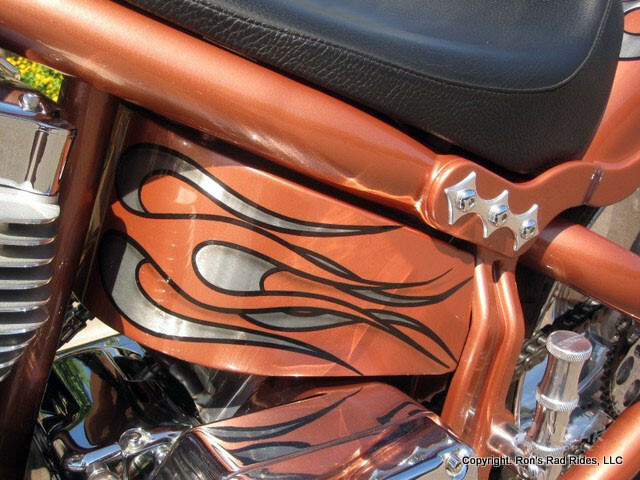 With the unusual Color combination and the "Metal Grind" Flames, the bike definitely stands out from the crowd no matter where it is - at a bike meet, or at your local watering hole. 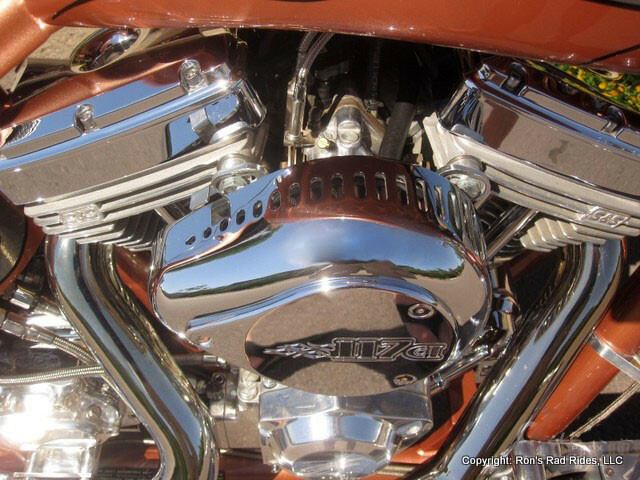 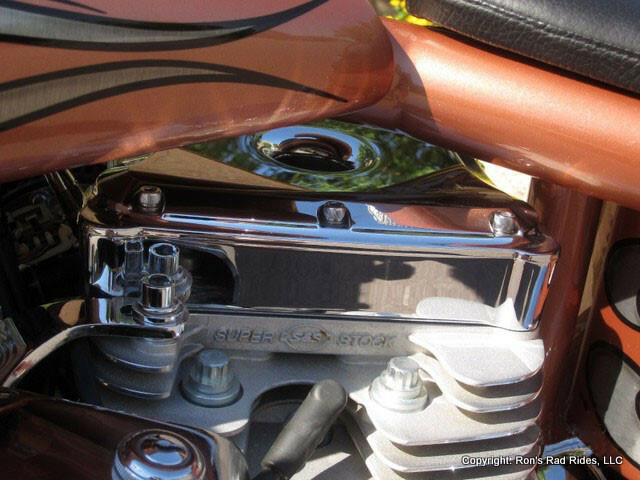 The trademark Chrome Plated Swift "Fat" Handle Bars feature Performance Machine Renthal Grips, Chrome Switch Housings, Hand Levers, and Clutch Perch along with Custom Billet Mirrors. 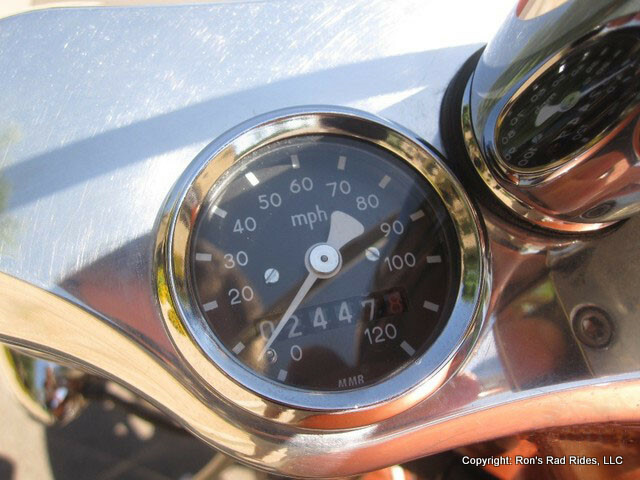 It also features an Analogue Gauge Cluster which includes Speedometer and a Tachometer very neatly mounted in the Triple Trees. 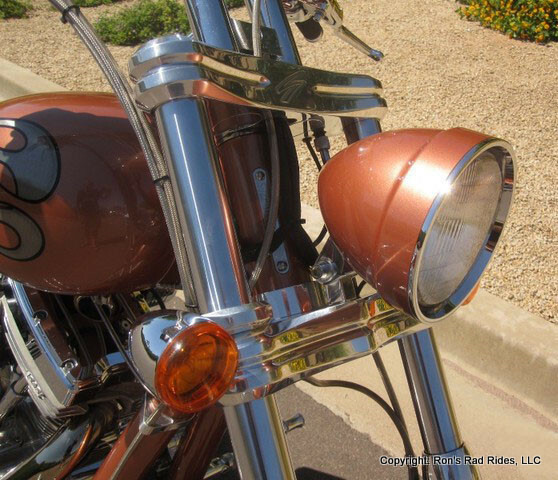 There is also an Oil Pressure Light, Temperature Light, Turn Signal Lights and a Bright/Dim Headlamp Light. 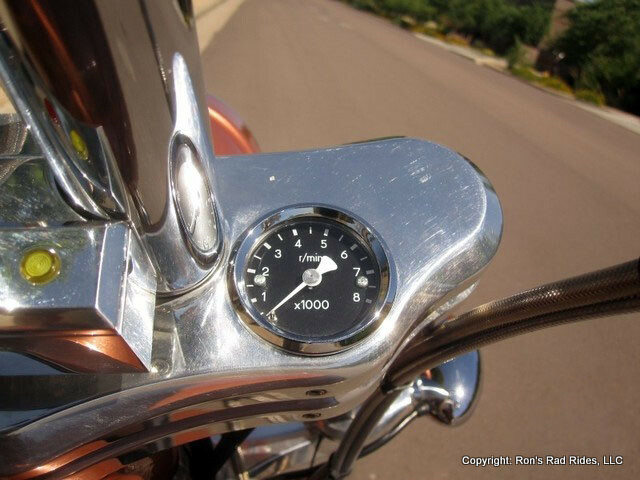 All of the Gauges and Indicator Lights work correctly with no issues. 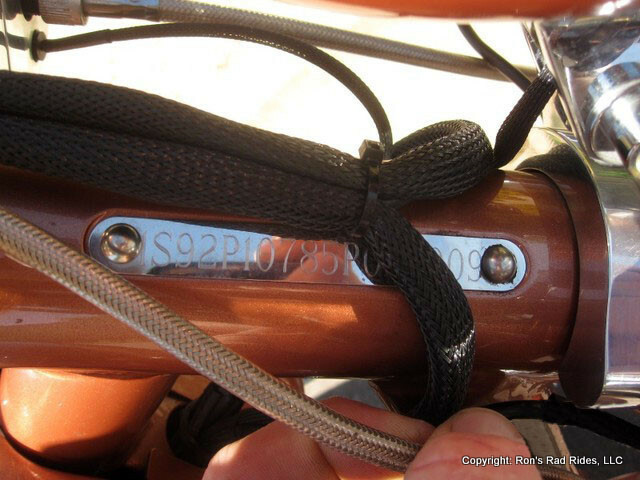 The bike also has a Keyed Ignition that comes with (2) Sets of Keys. 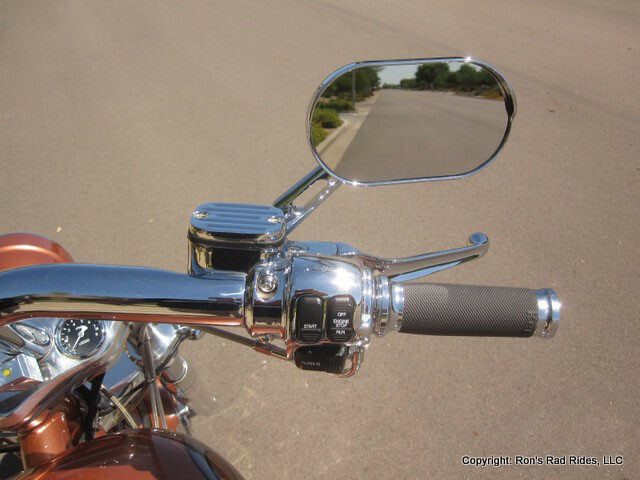 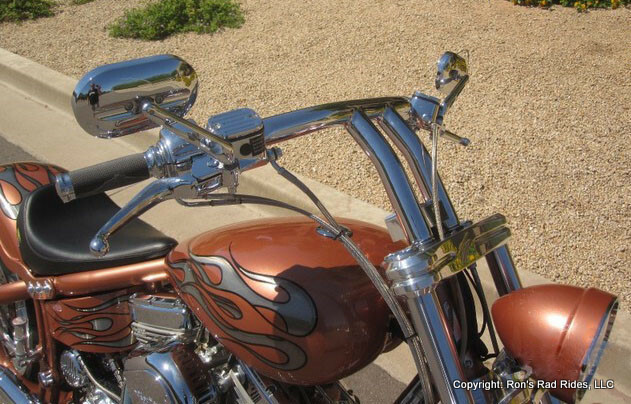 The "swept" Bars have a nice, solid feel and an easy spread, making them very comfortable when riding. 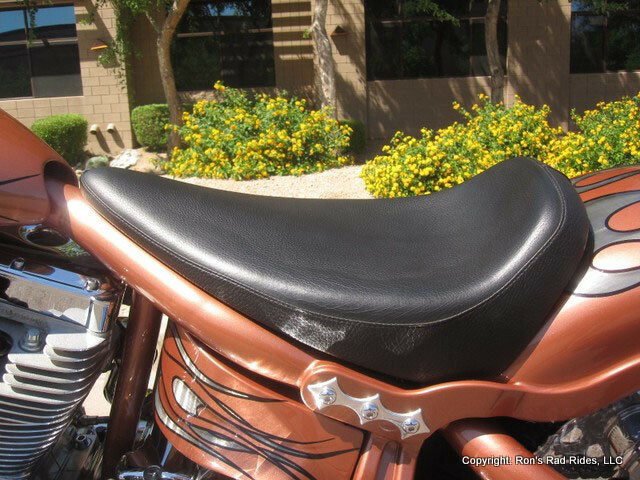 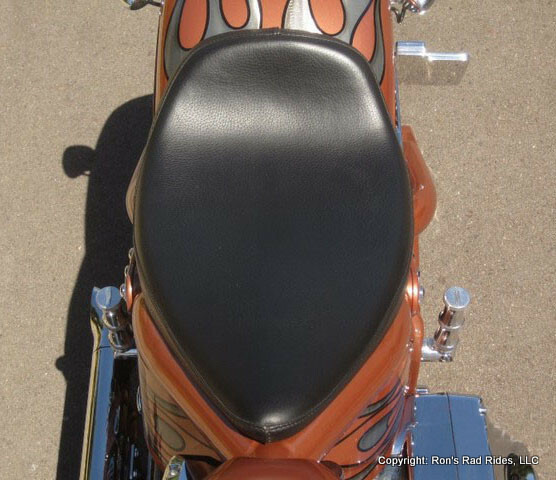 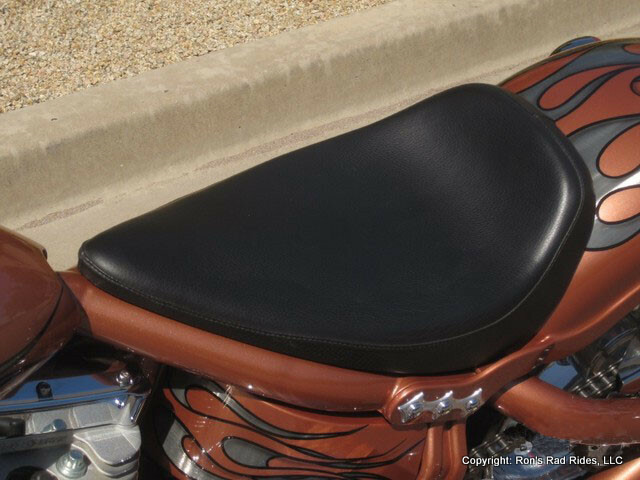 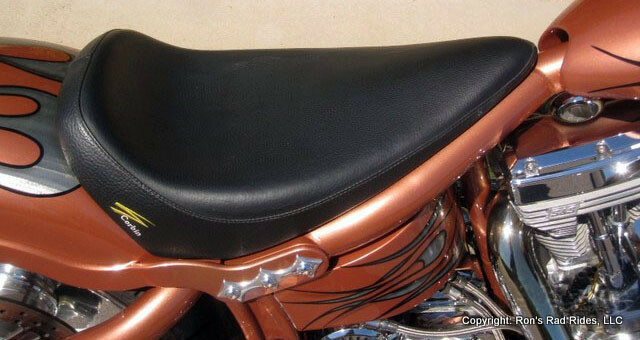 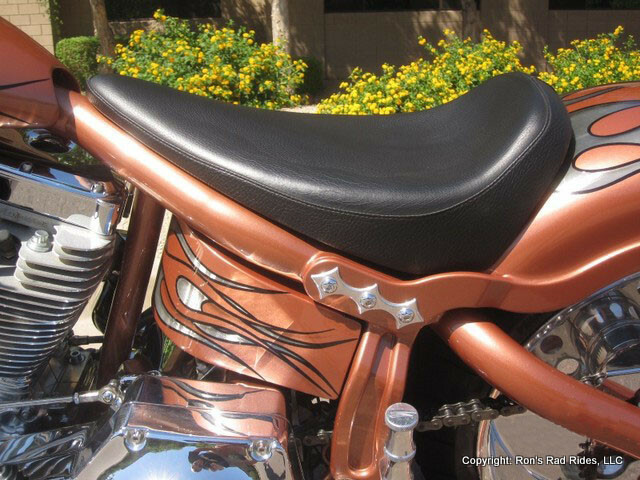 The plush Custom Corbin Seat wrapped in Black Leather, provides the perfect positioning and comfort for an extended ride. 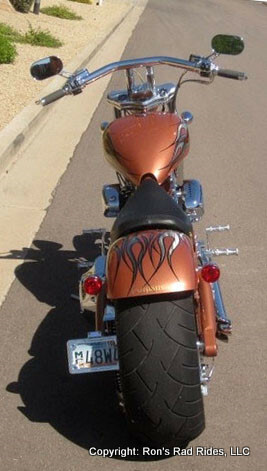 You have a very sturdy sense while riding this bike down the road. 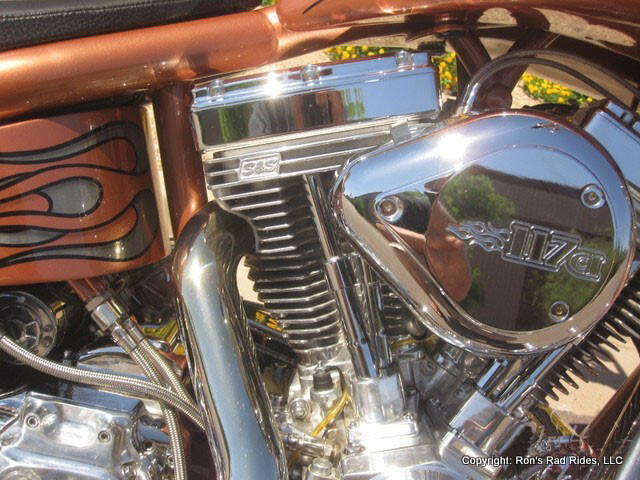 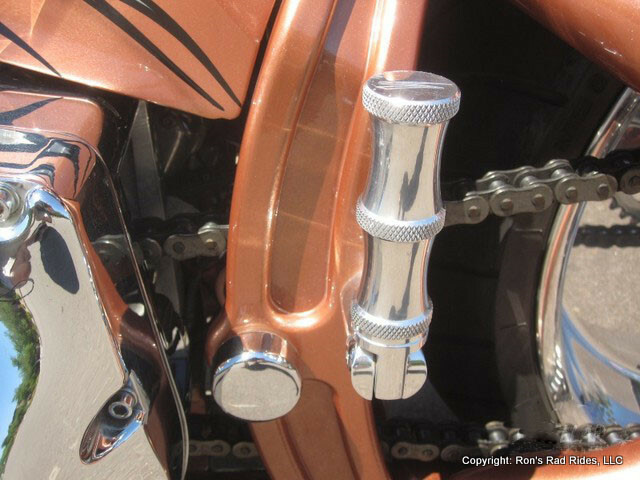 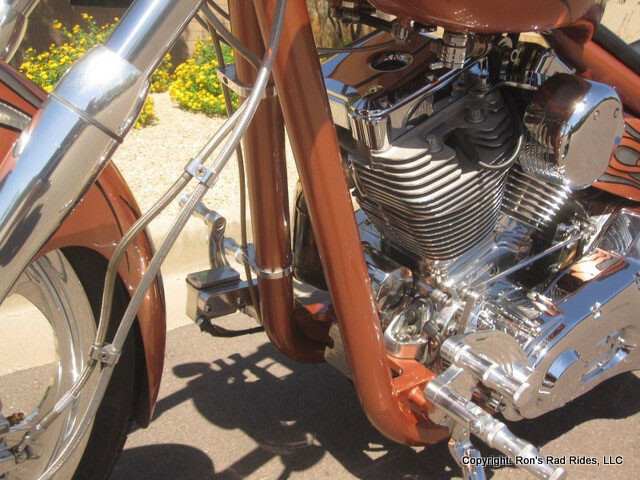 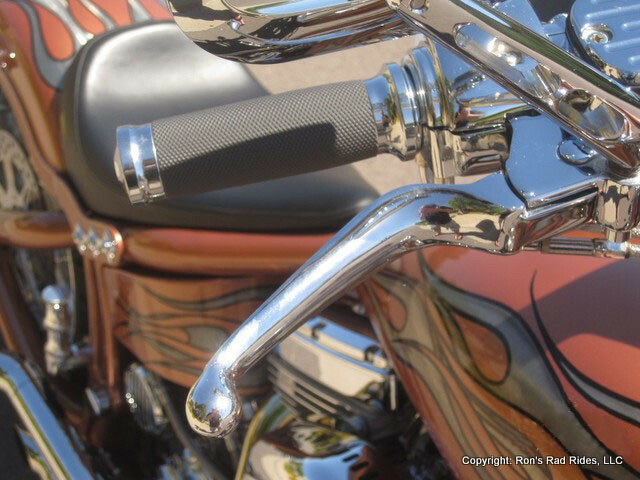 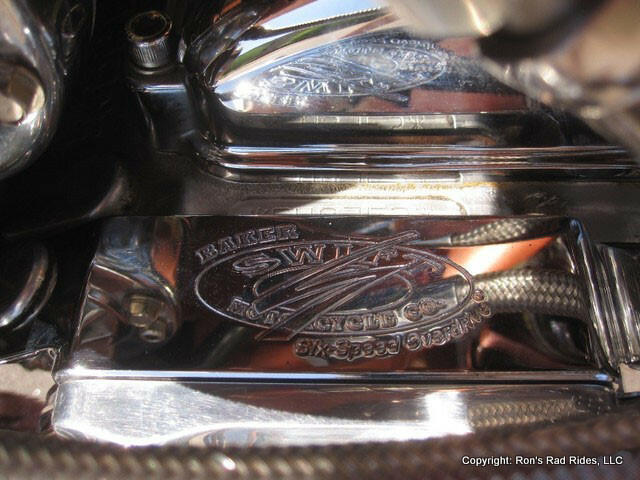 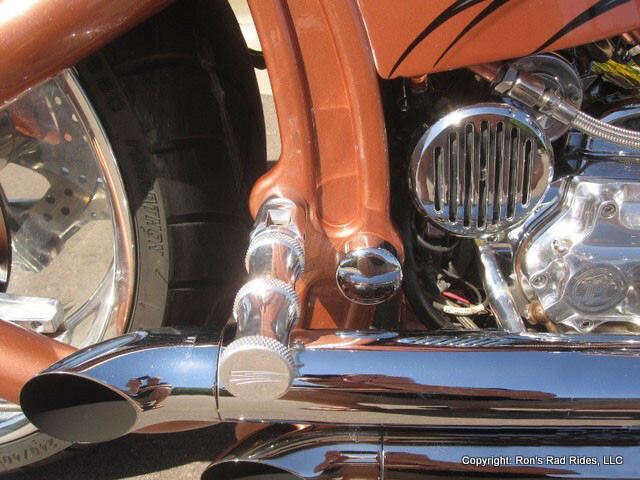 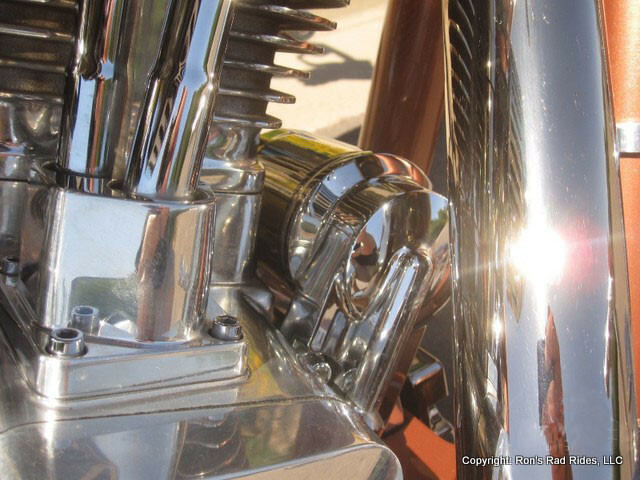 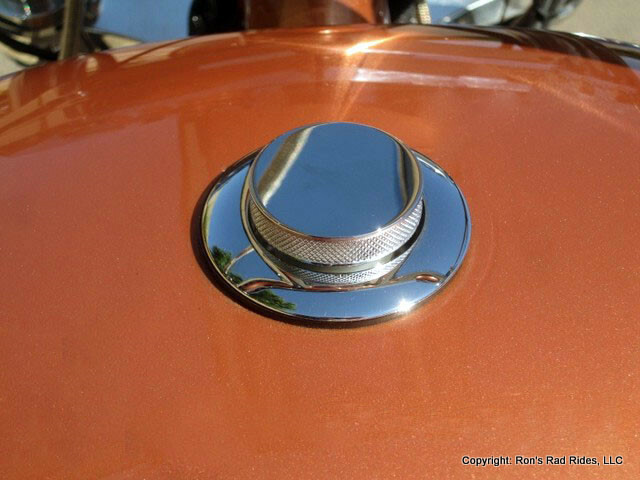 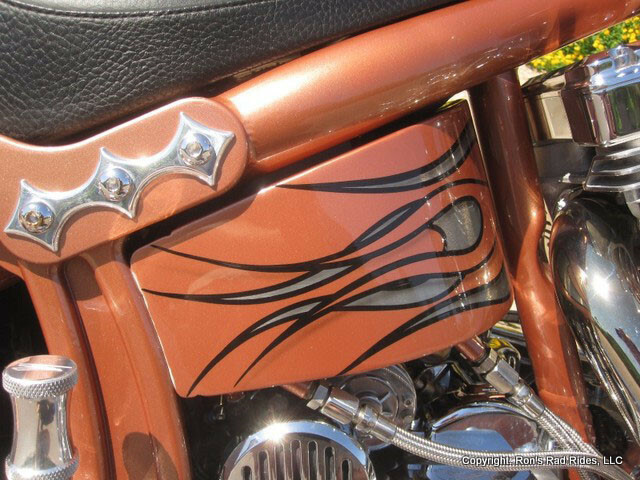 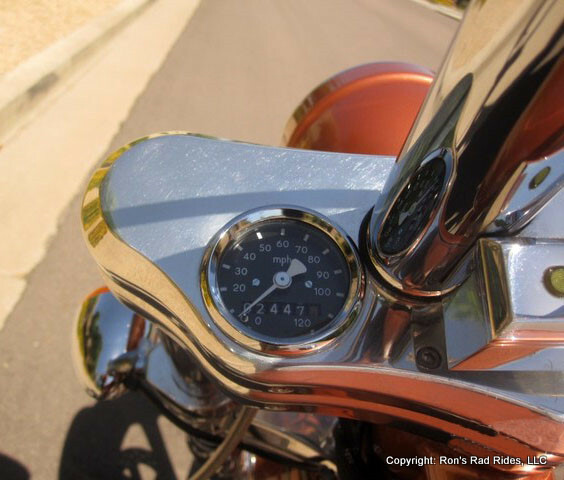 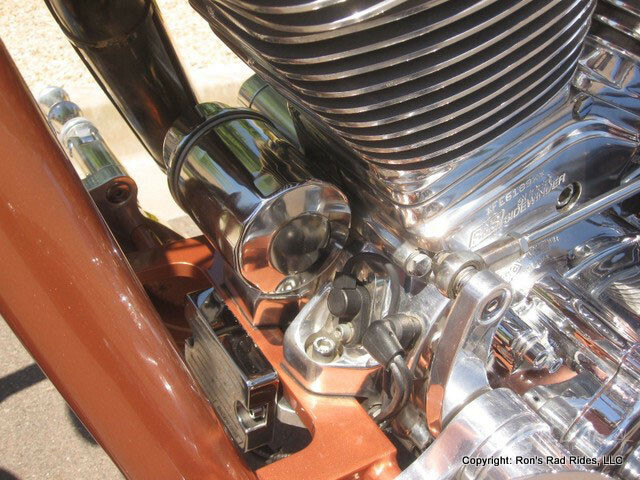 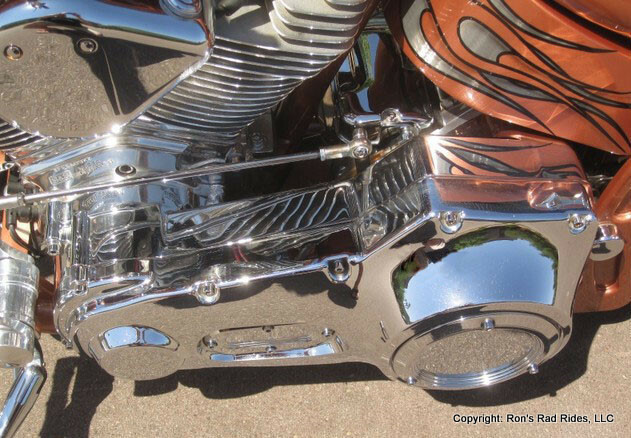 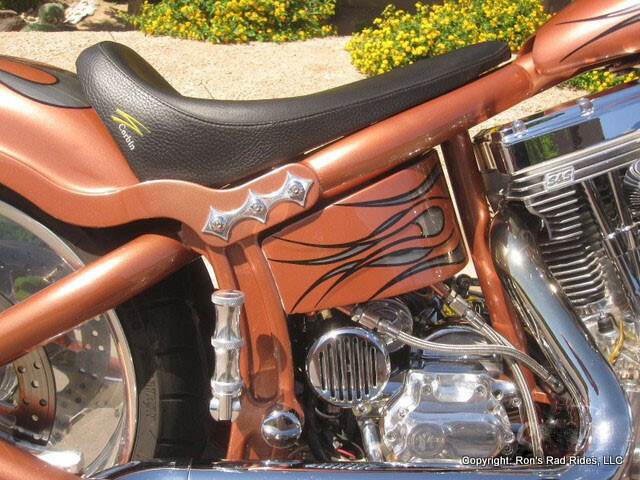 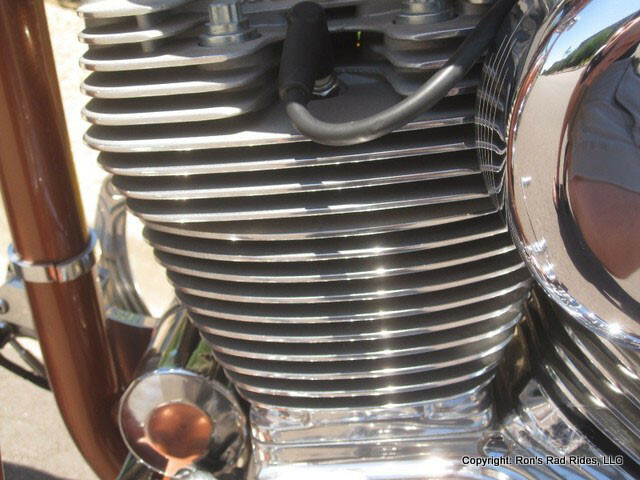 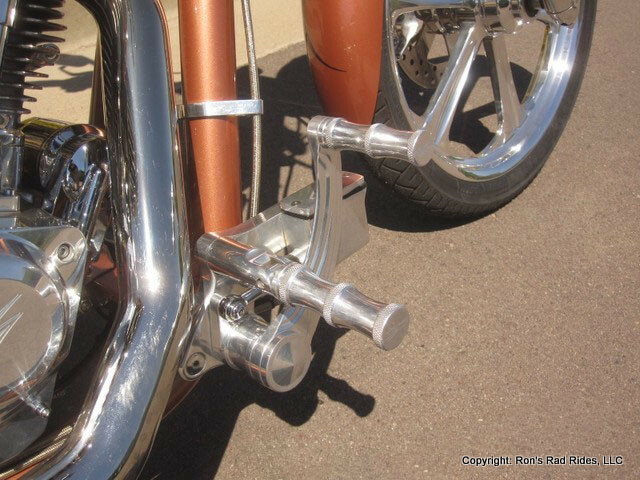 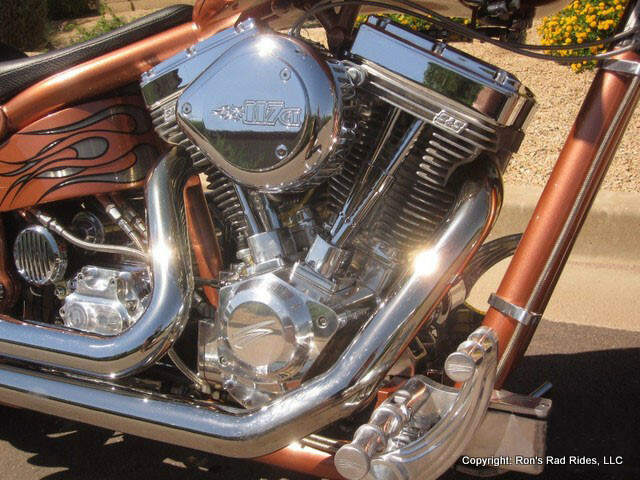 It also has a set of Fold-Down Rear Foot Pegs for the passenger that match the Custom Polished Billet Forward Controls. 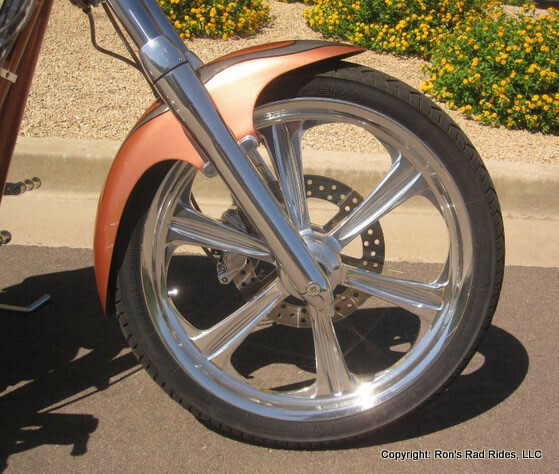 Last, but not least, the bike rolls on a set of Custom Aluminum Wheels, with the front being a 21" Multi Spoke pattern with matching Custom Made Billet Rotor and the rear featuring a very cool 18" Solid Disc which also has the same matching Rotor. 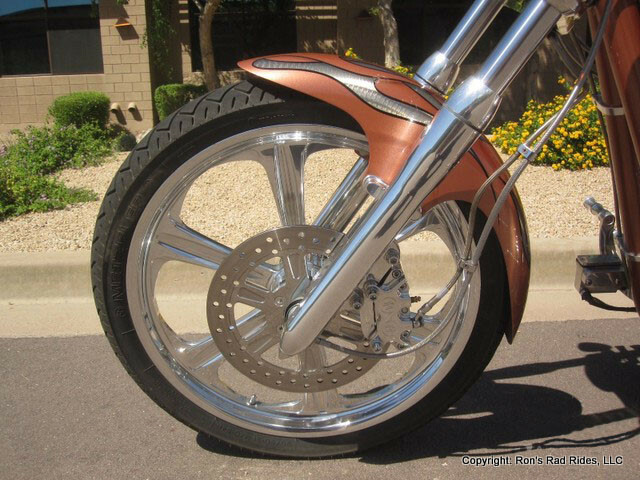 The wheel design looks exceptional and perfectly matches the flow of the bike. 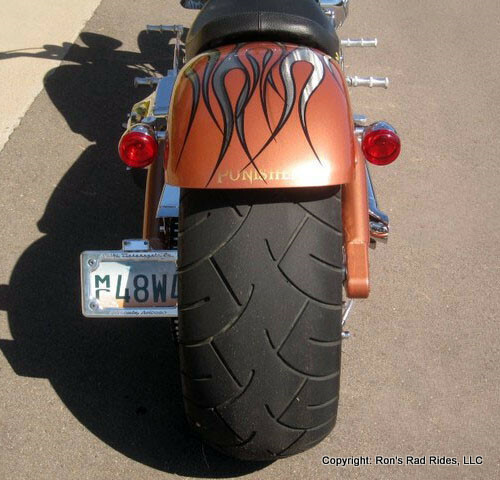 The Wheels are wrapped in Metzeler Rubber with over 85% tread life remaining. 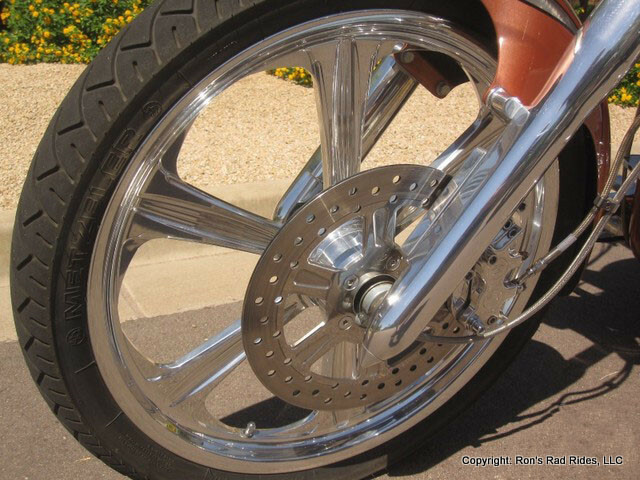 The front is a 90/90-21 and the rear is a 240/40/R18. 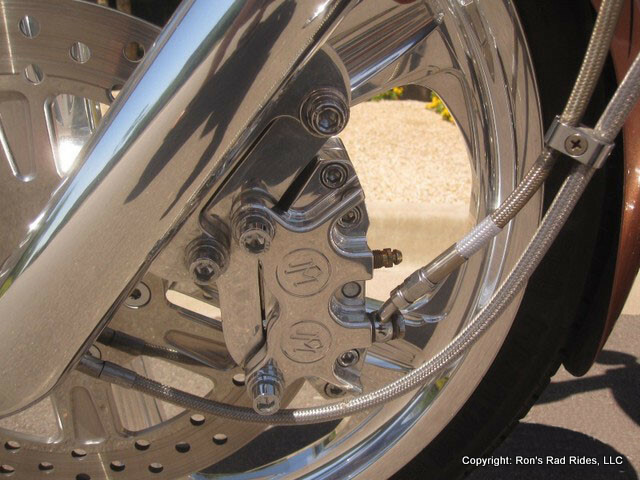 The bike stops via a single Performance Machine "PM" Dual Piston Billet Aluminum Caliper on the front and a Single "PM" Dual Piston rear Caliper. 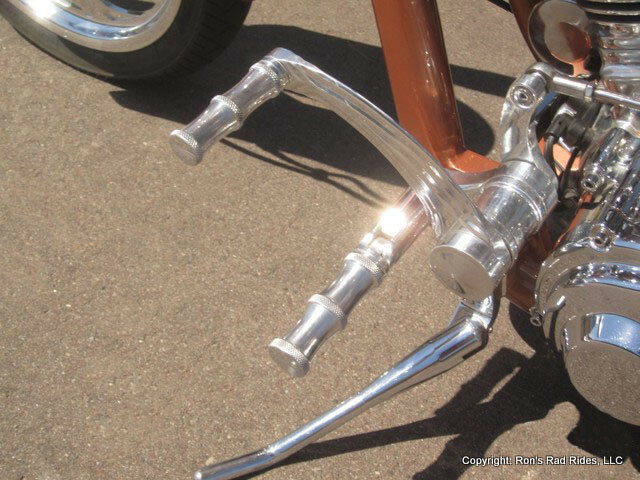 And.., it stops great with no brake pulsation. 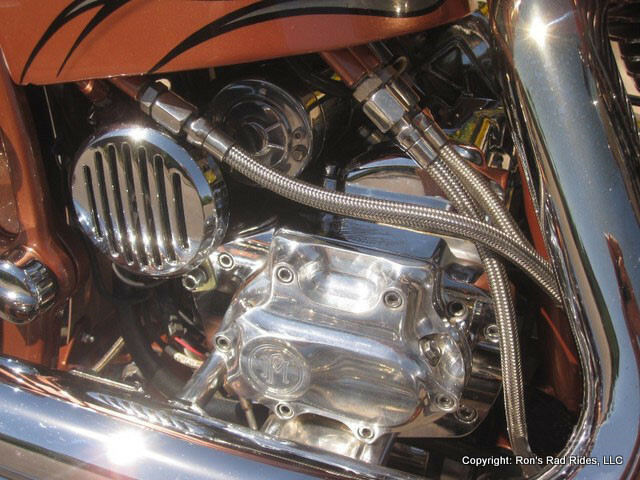 All of the Brake and Clutch Lines are Goodridge Steel Braided for maximum performance, safety and an extra clean look. 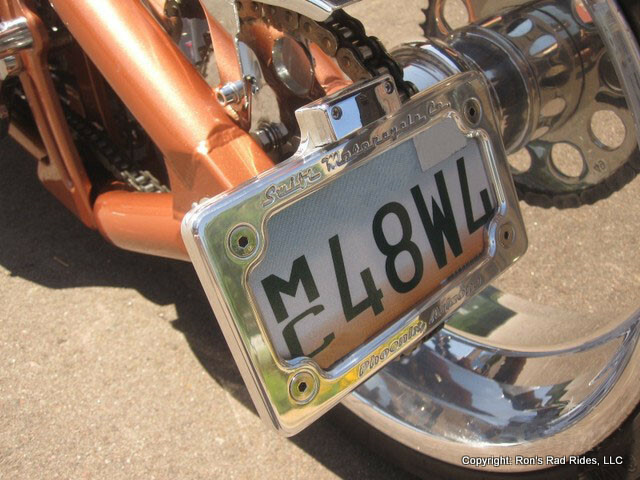 This bike also features a single color-matched Aluminum Headlamp, Chrome Bullet Turn Signals both front and rear and a side-mounted Billet Aluminum License Plate Frame with LED Lighting. 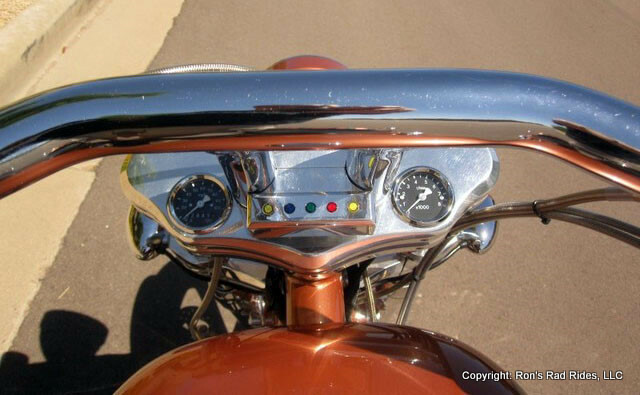 All of the lighting works correctly with no issues. 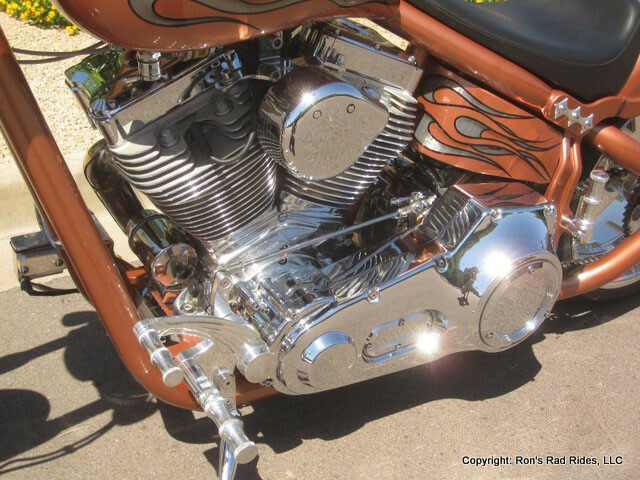 This was NOT a cheaply built bike..! 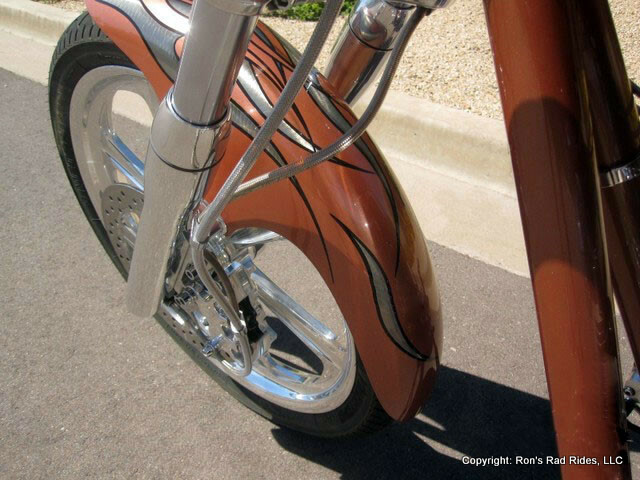 Only top notch parts were used in the engineering and build of this very cool chopper. 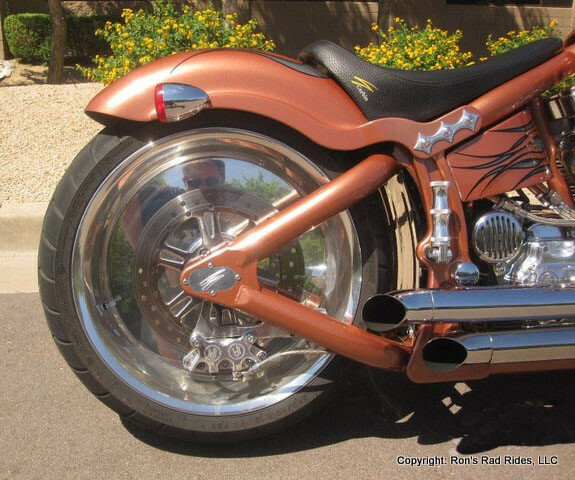 Note #1: If you are looking for a VERY UNIQUE looking Chopper with a Softail Suspension System, all of the "legal in any state" items including (Tach, Speedo, Turn Signals, correct horizontal Plate Bracket etc. 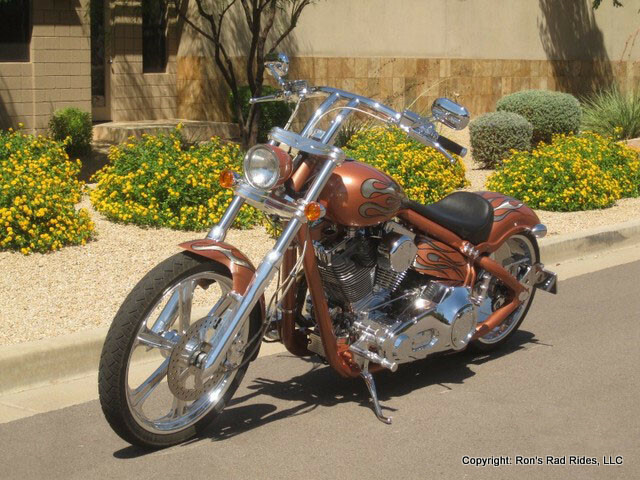 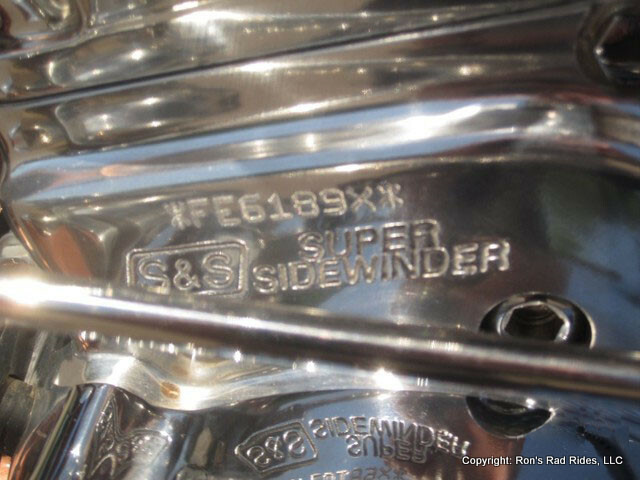 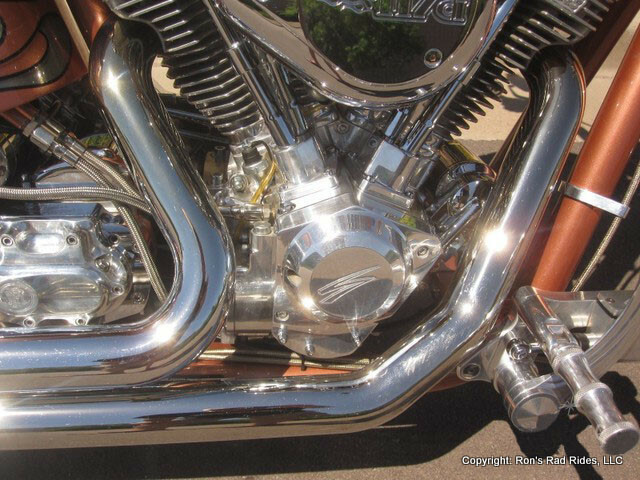 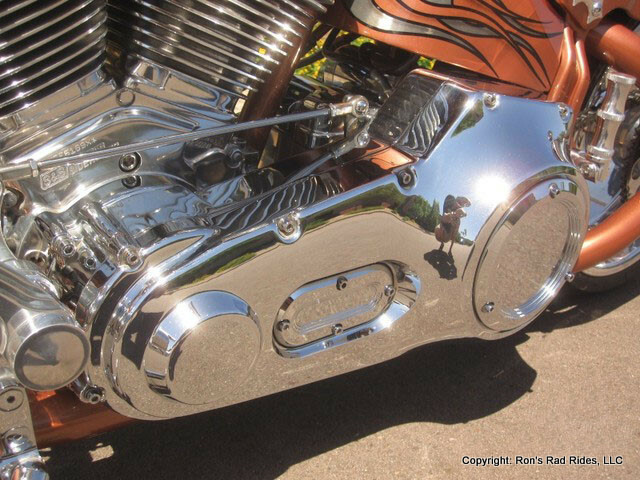 ), that has a SUPER COOL paint job, runs and rides superb, and has the top-of-the-line polished S&S 117" Super E Engine mated to the best-you-can-get polished Baker 6 Speed, you can't beat this bike..! 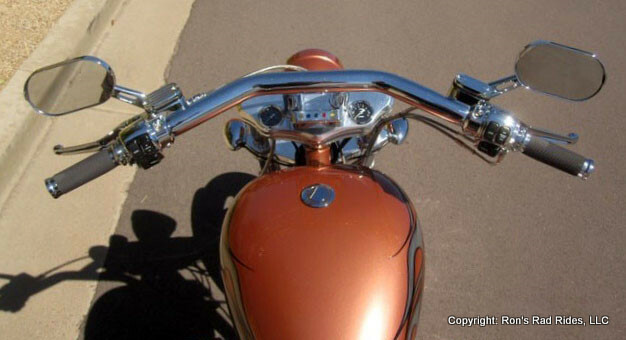 Plus, since it is a DOT approved Manufactured bike, getting insurance will be simple and reasonable. 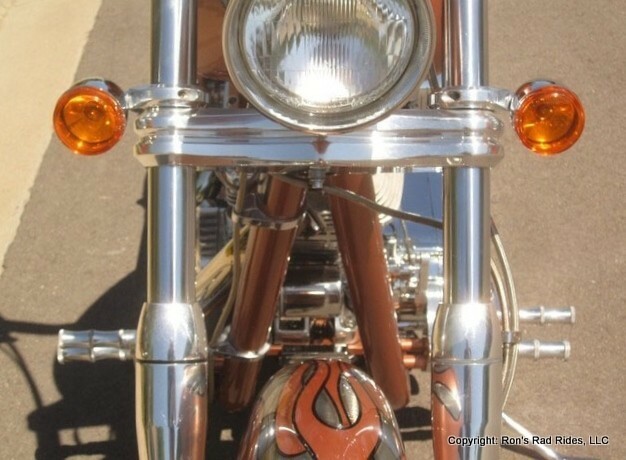 And.., regarding the price. 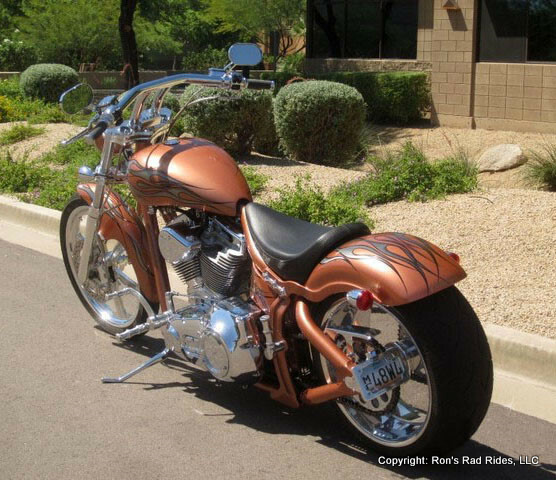 At only $17,950, you are able to own a manufactured Custom Pro Street Chopper that had an original investment of over $32,000..! 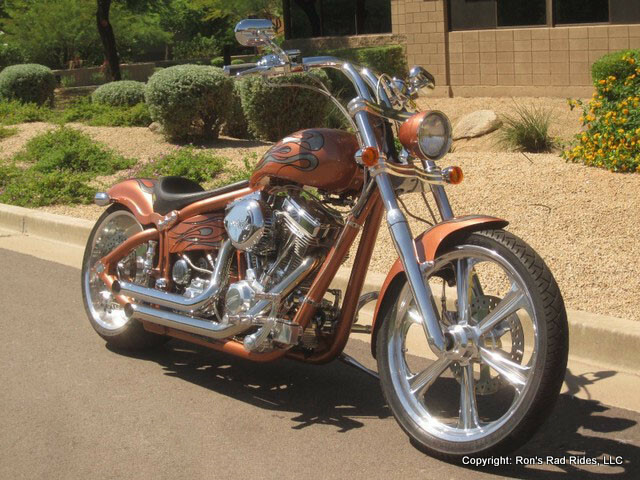 That's a sweet deal! 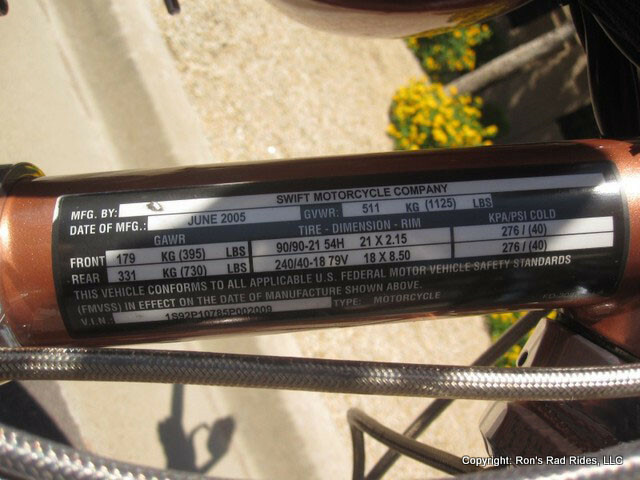 And.., remember, it has less than 2500 ACTUAL MILES on it.